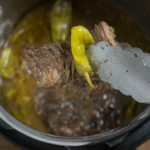 Place roast in the Instant Pot. With a paring knife, slice a pocket in the middle of the roast and insert the butter. Sprinkle the ranch dressing mix and au jus mix on top the roast. Lay peppers on top and add 2 tablespoons of the pepperoncini juice for an extra bit of tanginess. Close lid making sure steam release valve is set to venting. Set the Instant Pot to Slow Cook for 8 hours with the Normal temperature selected. Once you hear the beep you can remove the lid and shred the roast to the constancy you desire.